Want to get the latest info and tips for educators? Subscribe today! In today’s rapidly changing world and workplace, critical thinking is more important than ever. The most successful individuals are able to use creativity and reason to solve problems. They adapt, learn, and collaborate while investigating ideas and solutions. This 21st-century skill set is needed in all career fields and facets of life. From sports to science to art to astronomy, and everywhere in between, critical thinking is valuable. What Does Critical Thinking Impact? In the classroom, the value of critical thinking is tremendous. When teachers employ critical thinking in their instructional practices, they assess, evaluate and adapt their methods in real time to best meet the needs of their students. As these needs are met, student outcomes improve. When students practice critical thinking processes, they tend to perform better. One recent study has shown that they are more than ten times as likely to improve their methods when they are provided data to make decisions and feedback to evaluate those decisions (Holmes, Wieman, & Bonn, 2015). Incorporating critical thinking practices such as these into everyday classroom activities helps students become natural critical thinkers. This can apply across the curriculum. Though the details may differ, the principles remain the same. The process of critical thinking is an active and continuous one. As teachers, we can model specific actions and processes that students can use to practice critical thinking. 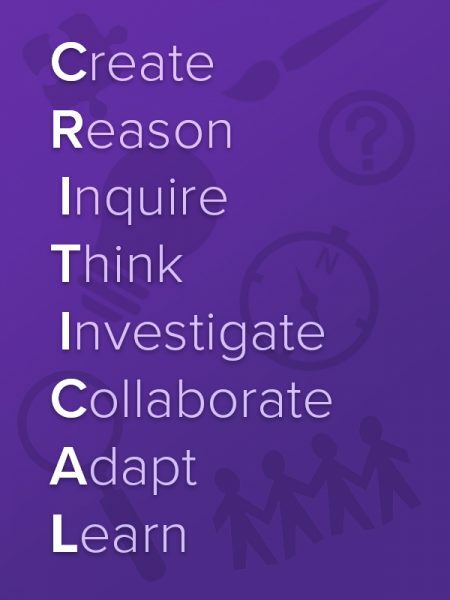 This acrostic is a helpful tool to remember key actions and keep critical thinking a focus in your classroom! Want even more ideas? Check out our other blog articles on critical thinking and our critical thinking products for educators! Holmes, N. G., Wieman, C. E., & Bonn, D. A. (2015). Teaching critical thinking. PNAS, 112(36), 11199-11204. Angela is a Math Editor at Mentoring Minds and former educator with over 25 years’ experience in the private sector and both public and private school spheres. As a teacher, she chased the “light bulb” moments, striving to make math fun and interesting for her students. Now she channels all of her experience and creativity into writing curriculum and translating difficult concepts into approachable content. After hours, you’ll find her working on a Doctorate degree, writing about Mathematical Matters for this blog, and dreaming in trigonometry terms.